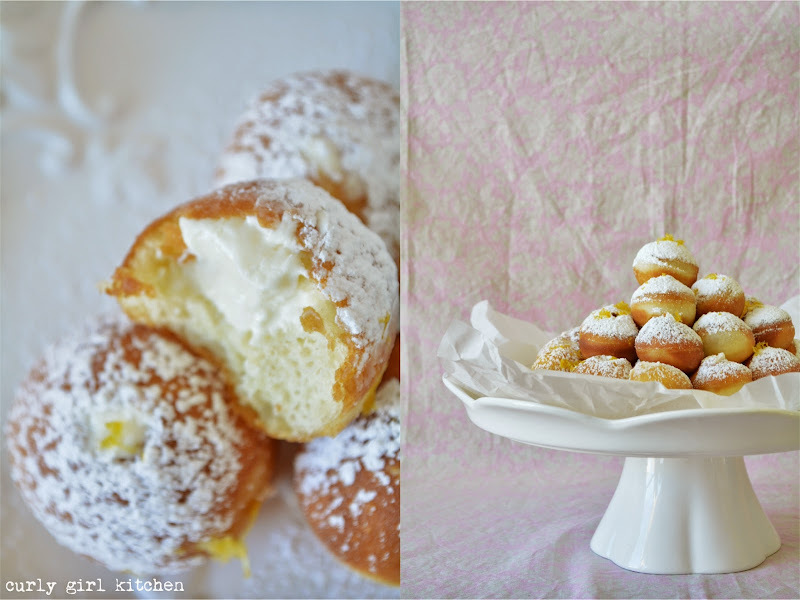 A while back, I made a batch of cream puffs that I never ended up sharing on my blog. I don't quite remember why - it could have been that I simply had too many recipes queued up to post and couldn't get them all written up (a problem I don't seem to be experiencing lately with being so busy with the house that I am baking less), or maybe I just wasn't that excited about the photos I took. These days, a bad photo shoot will stop me from posting a perfectly good recipe as I have begun to place more importance on quality over quantity. But for whatever reason, those cream puffs will forever be relegated to the dusty archives of almost-forgotten baking experiments, of which there are many others. We've had a round of colds and coughs run its course at our house, although my husband has been much sicker than I have been. I seemed to have lucked out with a one-day cold on Sunday, if a one-day cold is even possible. So we spent the day binge-watching Season 5 of The Walking Dead, my new favorite show. But he's been coughing and sniffling for a couple of weeks now, and last night I made a pot of homemade chicken noodle soup. I don't even like chicken noodle soup, really, which I realize makes me sort of odd. Most people crave it. But I crave hearty soups like spicy chicken and corn soup, or my absolute favorite, bean and ham soup. In most chicken noodle soups, the egg noodles are so slimy and slippery in the broth, which I find incredibly unappealing, so I rectified that by using Italian orecchiette pasta which had a nice al dente bite. I also added a can of unsweetened coconut milk for a little creaminess. I have to admit, it was pretty good after all. 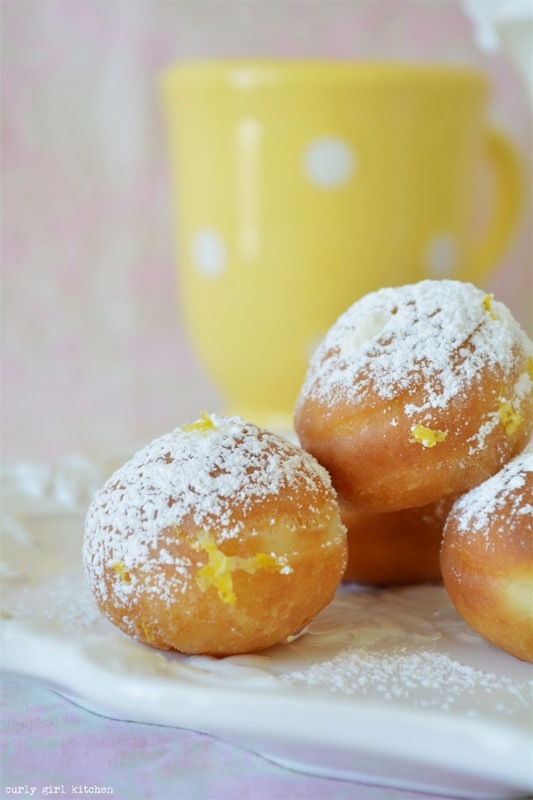 My husband would prefer that I make him doughnuts, though, which he insists that, combined with constant caressing and massages, would speed up his recovery. 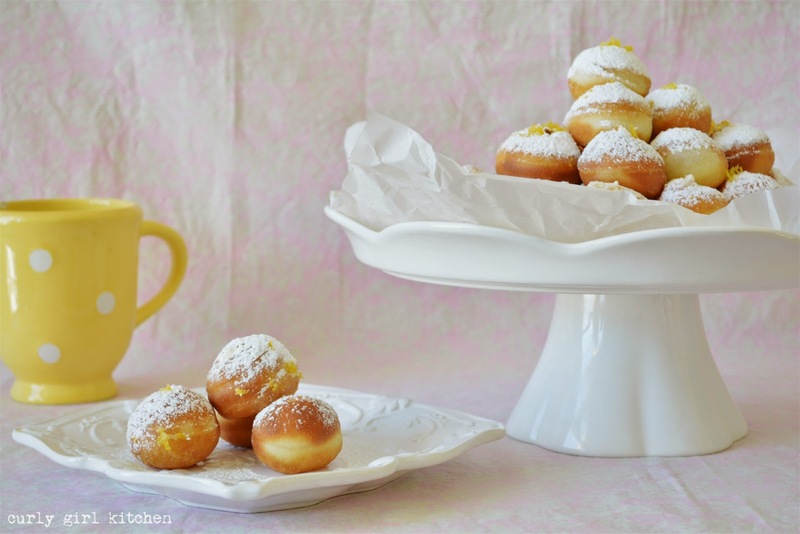 While thinking about those not-quite-forgotten cream puffs, or profiteroles, which is a much more interesting word, I thought I'd make a batch of doughnut cream puffs. 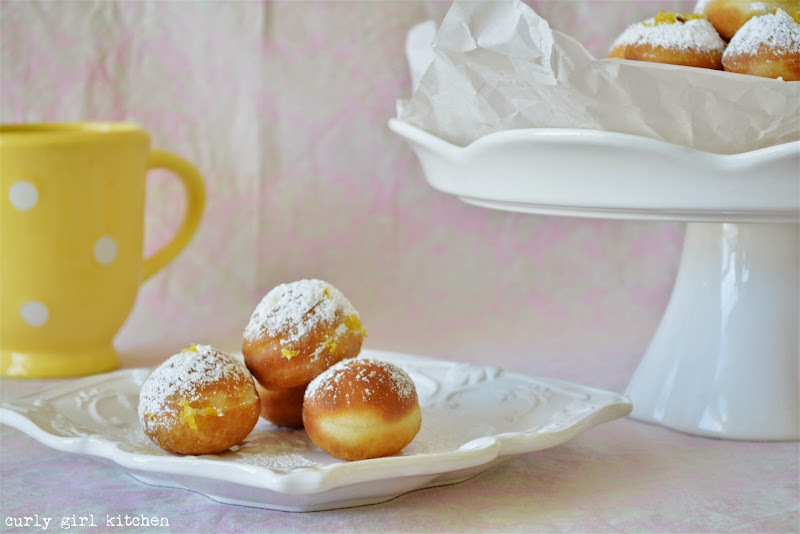 Not quite officially cream puffs, since they're not made with a choux pastry, they are very cream puff-like with light and airy fried dough, tart lemon cream filling and a dusting of powdered sugar. 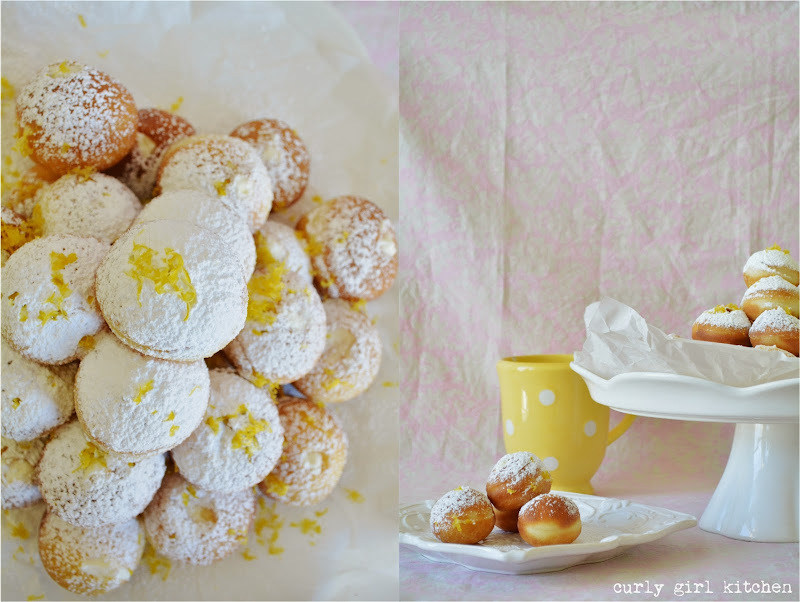 Fresh lemon zest adds a bright touch to balance the late spring snowfall of sugar. We froze the leftovers, and they're just as good as fresh, when microwaved for a few seconds. Perhaps I should test my husband's theory tonight, and see if a plateful of these for dessert gets rid of his cough. Not likely, though. Warm the milk in a saucepan or in the microwave until the temperature reaches between 110-115 degrees F. Pour into the bowl of your stand mixer fitted with the paddle attachment. Sprinkle with the yeast and sugar; let stand 5 minutes until foamy. With the mixer on low, add the butter, egg, salt and half the flour, mix to combine, and gradually add the remainder of the flour. Switch to the dough hook and knead on medium speed for 4-5 minutes, until the dough is smooth and starts to pull away from the bowl. If the dough is slightly loose and sticky, don't add more flour. Dump the dough into an oiled bowl, cover with a clean kitchen towel and set in a warm place to rise until doubled in size, about one hour. On a floured surface, roll out the dough to 1/2 inch thick. Cut the dough with a 1 1/2 inch round cutter, then gather any scraps and cut those as well. Place the doughnuts on parchment lined baking sheets, cover with clean towels, and set aside to rest and rise again for 30 minutes. Meanwhile, heat three inches of olive oil in a large saucepan over medium heat, until the oil reaches 365F. 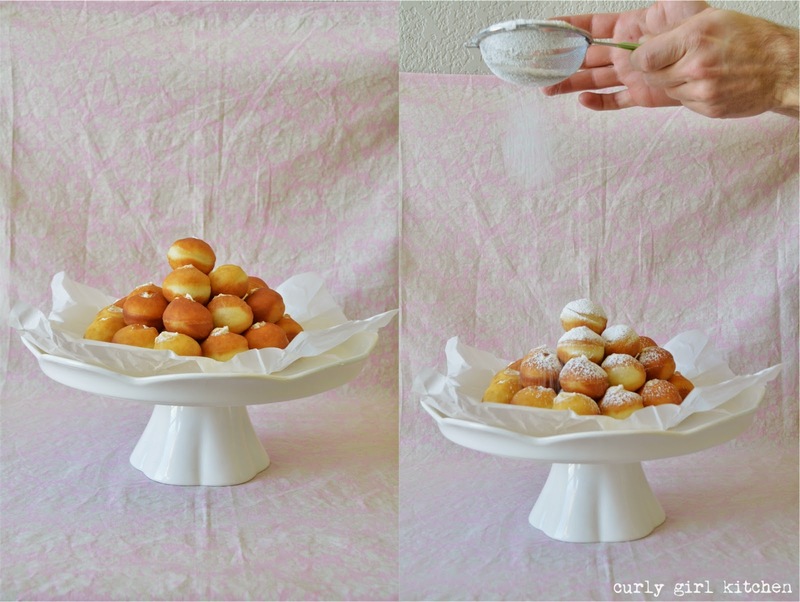 Working in batches with 5 or 6 doughnuts at a time, fry the doughnuts until golden brown, about 1 minute on each side. Drain on a wire rack and let cool slightly. 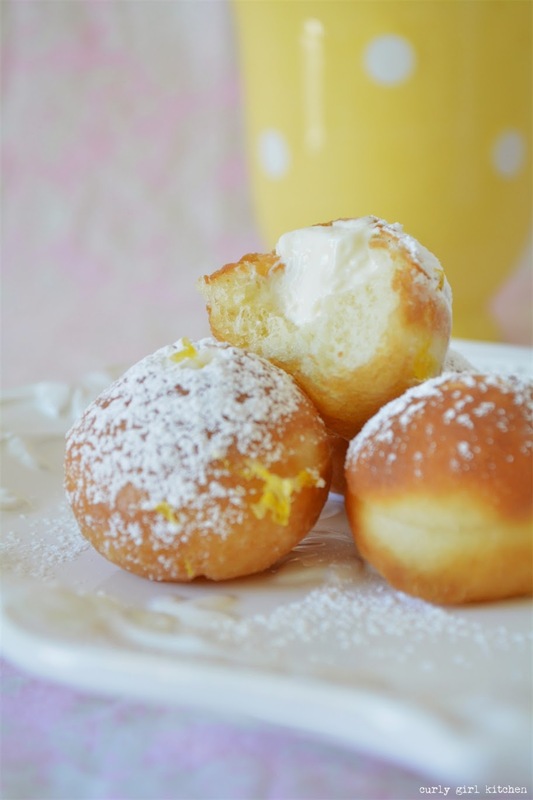 For the filling, whip the cream cheese, whipping cream and lemon curd until thick and smooth. Pipe into the doughnuts. 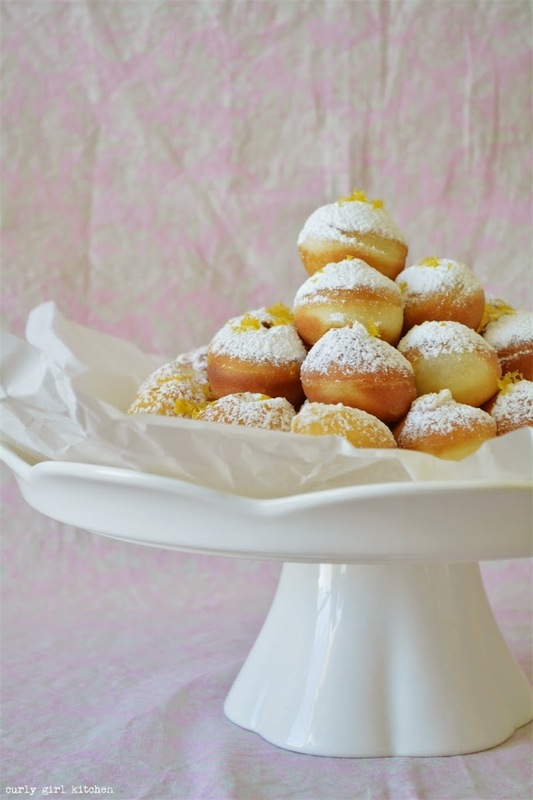 Dust them generously with powdered sugar and grate lemon zest over top, and serve immediately.